Ram Gollamudi has gained vast knowledge through his years of education. He did his B.Tech. from Indian Institute of Technology, Madras. Then, he went to pursue M.S from Iowa State University. Later, he did MBA from University of California, Los Angeles – The Anderson School of Management. After observing how education was being imparted in America using technology, Ram decided to digitize the way how educational institutions impart knowledge in India. By joining hands with two of his friends Ramesh Karra and Prasanna Boni, the trio conceptualized Ignitor. Our key offering is the IGNITOR Learning Platform. It offers Tablet based learning solutions for educational institutes for their student community. Schools are taking digital learning experience to the next level by focusing on latest technological devices such as tablets. IGNITOR helps schools deploy tablets in the hands of students by delivering a full solution – consisting of software platform as well as content bundle consisting of Digital Textbooks, Multimedia content & Assessments. 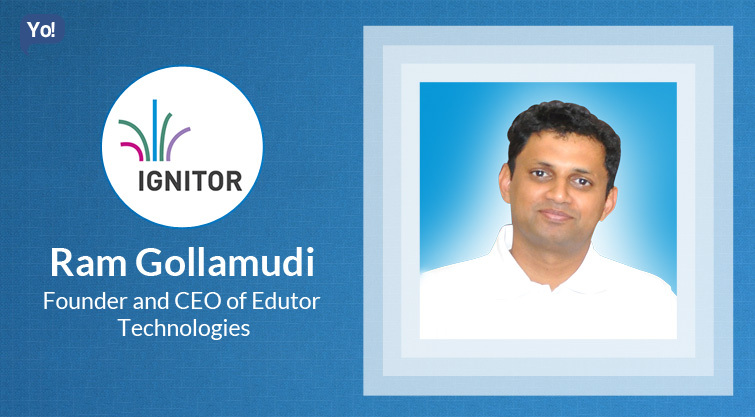 IGNITOR – is the sole and flagship product that Edutor Technologies develops and markets. It was launched in 2010 when touch screen devices were gaining popularity. iPad had been launched, and Android devices were just making an entry. At that time, iPod Touch devices were being used in US schools to help young learners. We recognized the power of such devices in engaging children and felt that this could really be used positively in education. With a dream of leveraging such technologies to make a large impact in a country like India, IGNITOR was started. Since then we have stayed true to our core of trying to leverage such technologies in education. The journey has been most interesting and a learning experience for all of us in ideating a completely new kind of product for the Indian market and turning the idea into a viable and sustainable business. Most of our effort goes into educating the key market stakeholders like parents, teachers and principals to help deliver superior experiences. Investors are always willing to invest in quality businesses with significant moat and sustainable unit economics. We build our business around those principles. The company has raised investments from several high quality investors like Safari, SRI Capital, New India Ventures. Employees stay if the company offers them great work, an environment, which can help them learn and grow, and benefits, which add value to their contribution. Play sports and read regularly. What are the benefits of IGNITOR? Student engagement is maximized through Enriched content experience – using our technology we work with publishers to offer enriched content to the students. Rich animations, video, interactive activities all woven thru an intuitive consumption experience, which works toward engaging the student and teacher. The solution does not raise technology dependence or reduce role of human intervention. In fact, the endeavor is to humanize the classroom i.e. move from a routine monologue based instruction by teachers to more interactive learning facilitation by the teacher. The focus is on reducing a lot of the administrative tasks of the teacher – thus freeing up time for the ‘real teaching’ – actual lesson planning, delivery, remediation, differential intervention etc. What is your pricing model for each offering? IGNITOR has two components a) Software + Cloud + Content b) Hardware. IGNITOR software and content annual subscription costs between Rs. 3,500 and Rs. 5,000 per student, depending on the grade the student is studying. The software works across most branded Android, windows 7/8/8.1 and iOS devices. What were the challenges you faced while developing Ignitor – in terms of devices, pedagogy, content, etc? Hardware constraints: When IGNITOR was being developed, the Tablet market was still quite immature. Devices were either very expensive or of very poor quality. IGNITOR was developed to run on low-end devices – i.e. it was optimized to work on devices with very low processing power. Working with limited infrastructure: Given the poor internet bandwidth and the kind of wifi access point investments that schools have – one cannot expect great infra with the Educational Institutes. The solution thus had to be designed to work with minimal infrastructure & costs. Who are the co-founders and what made you to start your venture? The two other co-founders of IGNITOR are Ramesh Karra and Prasanna Boni, both of whom are my classmates from IIT Madras. Ramesh Karra has over 12 years of sales and marketing experience and brings a strong understanding of the Indian consumer landscape – having worked with company boards and marketing teams across sectors as diverse as aviation, banking, media, oil and gas, consumer goods and telecom. Ramesh has an MBA from Indian Institute of Management, Calcutta and a B.Tech from Indian Institute of Technology, Madras. Prasanna Boni has 14 years of entrepreneurial experience and co-founded YASU Technologies a software product company in Hyderabad.Prasanna also ran an initiative that took mobile science labs to kids across schools. Prasanna has an MBA (PGPX) from Indian Institute of Management, Ahmedabad and a B.Tech from Indian Institute of Technology Madras. All three of us are strong believers of the power of personal learning and took on the challenge of helping millions of Indian kids discover and learn more. The three friends teamed up to build a digital learning platform that could be used within and outside the classroom. The start-up was incubated at their alma mater IIT Madras, and became operational in April 2010. IGNITOR is sold to Educational Institutes – who in turn offer it to their students/parents. We offer a product to 3 segments – Schools, higher education institutes and Test Preparation Institutes. The focus is on the K12 segment i.e. schools. The platform itself addresses the needs of multiple stakeholders. The key stakeholders and consequently target audience are schools leaders (chairman, principal, director etc) and parents. Are you planning to introduce IGNITOR in B2C market? Currently the platform is designed for an institution to deliver experiences to the students. We enable institutions to offer B2C products (Aakash iTutor). While we don’t have immediate plans to go B2C – one never knows if delivery of “next-generation textbooks” directly to consumers would happen. Are you also responsible for the handling the edits in the content? Teachers or the school is responsible for publishing any changed content. However, we assist the teachers to perform the same. It is the teacher’s call on how to conduct the class or use the platform. Our education coaches engage with the teachers to design and implement pedagogy interventions in order to use the platform effectively. How do you ensure security of content on IGNITOR? We have a proprietary encryption and obfuscation algorithm that provides security to the content. The content can be consumed only through our software – ensures security. The SD cards are write protected to ensure that the content package is not damaged/changed by anyone – ensures accuracy. We also have a user registration process, which ensures that only authorized users access the software/content from authorized devices.